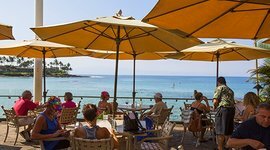 How do you choose where to eat on Maui? Let’s say you’ve done your research and found the perfect spot - rave reviews on Yelp, recommended by foodies everywhere, etc. But now you have to drive to get there, and when you do finally arrive, there’s a line out the door! 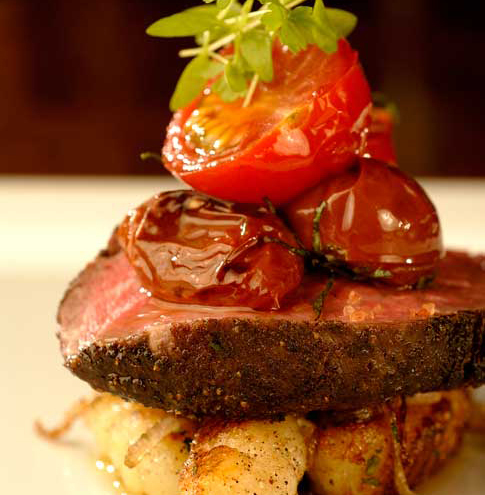 But what if that perfect Maui restaurant were at your resort? Better yet it had a magnificent view of the ocean, even better at sunset, and offered happy hour discounts to make going out to eat for a night or two much more affordable. Well, this place may just exist. You just need to know where to look. Here are five great Maui restaurants at resorts, many of which you might miss, as they're tucked away by the pool or the beach. This is the restaurant you come to woo, maybe even propose, to the one you love. If the fabulous hillside views, beautiful garden seating, and chic architecture don’t do it, then the Michelin Star quality food and mixology will. As one diner said, it’s like being “seated at a table in Villefranche on the French Riviera, but with a stunning tropical ocean view.” Yes, the view at this Wailea restaurant is that good! But let’s take a look at the food. It’s Italian inspired, as you can tell by the name, but with local ingredients. Their raw menu features Cured Ono with roasted tomato vinaigrette on a crostini. And their Grilled Hawaiian Catch is finished with bean ragout, bacon vinaigrette, and lemon chive butter. It’s pricey, don’t get me wrong, but if you want to impress, it’s pretty much a sure thing. They do offer a happy hour where drink are $5 off and appetizers $10 off. So come early and enjoy a drink and whet your palate for the main event. Capische? 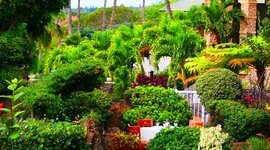 is located at Hotel Wailea, a boutique Maui resort in the foothills of Mt. Haleakala. It's hard to be closer to the ocean without actually being in it. 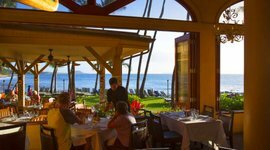 Almost hidden within Napili Kai Resort, the Sea House Restaurant on Maui overlooks the stunning crescent shaped Napili Bay. The food is also delicious too. They’re open for breakfast, lunch and dinner, but their claim to fame is Happy Hour. Seriously, they offer one of the most extensive happy hour menus on the island. From 2 – 5pm they serve up drinks for 6 – $8 and appetizers (dessert too!) for 5 – $7. This is the perfect spot for a late lunch or early dinner drink as the sun starts to dip over the ocean. It’s been around for 50 years, let’s hope for another 50 more! Sushi and the beach and good times – that’s 5 Palms. 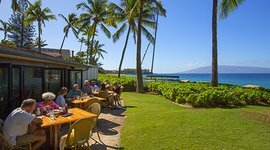 Set only a few feet from the sand at Mana Kai Resort, this Maui restaurant gives you an unobstructed view of the ocean. It’s a nice family friendly place that also offers not one but two happy hours for the adults. From 3 – 7pm you get deals on drinks and pupus. Highly recommend the Lobster Dip with Won Ton chips. From 9 – 11 pm, all sushi is 50% off. It’s also open for breakfast and they with a buffet and a “pour your own champagne” mimosa station. Some say it’s Maui’s best brunch. 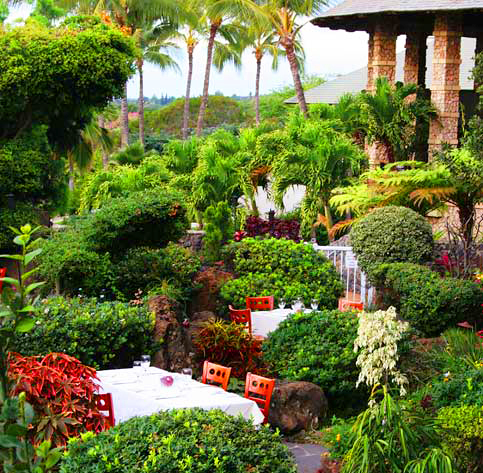 The line out the door of this hidden gem, tucked away in Napili Shores Resort sure seems to think so. 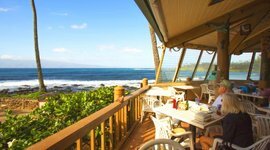 Overlooking the ocean from inside an actual gazebo, this Maui restaurant serve a simple yet delicious breakfast. The white chocolate macadamia nut pancakes only gets better when slathered in coconut syrup. Their fried rice - a Maui breakfast specialty - is also quite delicious, so is the Big Kahuna Omelet. It’s good to know that the portions here are supersize. One order of pancakes comes with 3 huge pancakes, big enough for many kids to split. Now here’s the thing about the line, it does come with amazing view where you can watch surfers catching waves. 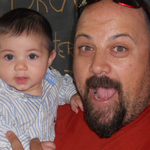 Be sure to come early (before 9am) and bring something to entertain the kids. And hey, if you happen to stay at Napili Shores you have a leg up. Early bird gets the worm, and this case the early bird gets the best pancakes on Maui. Still trying to choose where to eat? Walk along Ka’anapili beach and up to this quaint bungalow-style cafe. Located by the pool at Aston Ka’anpali Villas, this restaurant serves up delicious fish tacos with fresh fish, sautéed peppers, and onions on a corn tortilla. They have a great kid’s menu too with Dino-sized chicken nuggets. If you come for breakfast order the Cinnamon French Toast with a side of ½ pineapple and you wont be dissapointed. 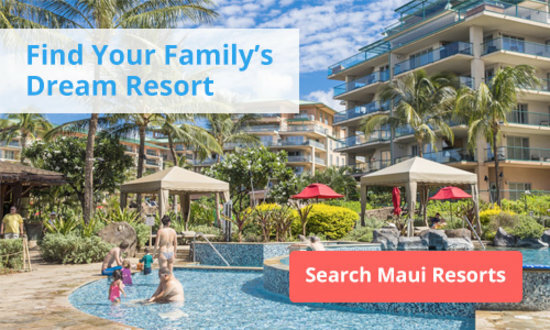 To get here in style, park at the beach near the Westin and take nice stroll on Ka’anapali beach headed south for a few minutes until you reach Ka’anapali Villas. This is where you'd come to propose in grand style. Set in a tropical garden with gorgeous views of the Island, Capische? serves delicious Italian food with a local twist.